Christmas in Peru was anything we had ever experienced. For one there was definitely no snow, but there wasn't any in Wisconsin either this year. It was the first time we didn't participate in at least one mass Christmas Eve and Christmas Day. Our Christmas Feast didn't consist of what Americans normally eat. None of these things were missed though! The joy that we experienced over the week of Christmas was much greater than any of these things. We started Christmas week with two masses on Sunday. The first was in Nuevo Egipto followed by one in Nuevo Chimbote. It was the first time Padre Paco celebrated mass in the future spot of the church in Nuevo Chimbote. The town has given the people land to build a church. Right now we are working on clearing the old broken building from the spot to build. Taylor and I are working at finding the last of the funds to build this amazing community a church. To learn more about Nuevo Chimbote please read the two blogs here and here. 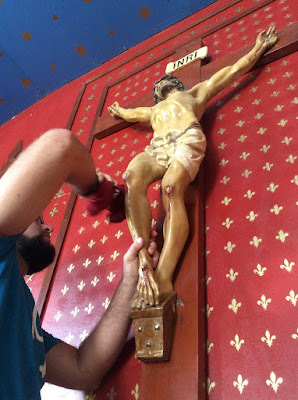 Monday we were blessed to have mass in Caspizapa. It was our first mass in a month and also a sacrament mass. We had been preparing five youth to receive their sacraments since we returned in October. It was so exciting to be apart of this special mass. Not only did they receive baptism but the four older youth received first communion as well. We will also be preparing three of them to receive confirmation next December. This mass was also our Christmas mass for Caspizapa. We were able to light all of the Advent candles and celebrate the coming of our Savior. Tuesday was a very special day. Faustina and Adele turned one! I can't believe how big they are. It is hard to imagine how fast the time has gone. The girls and I went for a home visit. The family we visited was the first family to welcome us in Caspizapa. They were so happy to be able to spend time with the girls on their big day. We celebrated with animal crackers and soda. 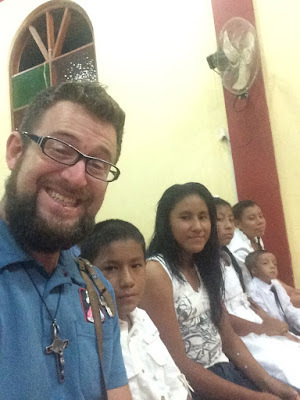 We then headed to Nuevo Chimbote for our sacrament prep and then off to mass in Picota. Padre Paco said a special mass intention for the their first birthday. We had a small party with Padre Paco after mass. We had a special dinner and we ate the carrot cake I made for them. To our surprise Padre Paco had a gift for each of them. Faustina and Adele received their first doll from Padre Paco. Wednesday was another busy day. We went to buy special Christmas dispensas for the people in our community. It was so much fun purchasing the food and other needed necessities for them. Our cart was overflowing and our joy was overflowing as well. We couldn't wait to hand them out on Thursday! Wednesday night we went to our Bible study in Nuevo Egipto. With us we brought the Nativity Story. We were excited to share the beautiful depiction of Saint Joseph and the Holy Family. The church was packed with little children, some of whom had never heard the story before. There were also many adults who joined in on the movie. After the movie Taylor shared a little about why this movie is so important and he became overcome with emotions. The people were very excited to share in this and so happy for us to share some time with them before Christmas. Thursday is the day so many people wait for. The day in which kids are super good because they know who is coming. But Christmas Eve has a different meaning altogether here which we found out as the afternoon turned into evening. Our day began with packaging up the Christmas dispensas we had purchased. We then all loaded into our car and headed to each house. We were so blessed to bring a little Christmas joy to the families we visited. We spent some time visiting with them and inviting them to the Christmas service that evening. I spent some time while the kids were napping wrapping the remainder of the Bibles and some last minute gifts for the neighbor kids. Taylor and I then headed to the church to see how the preparations for the living nativity were coming. The youth group was ready but they didn't know how to make the fabric into costumes. We spent some time putting the costumes together and then had a quick run through before the liturgy service. The run through went great and I ran home to make a few sheep ears for the sheep. We put the kids in their costumes and waited for 7:00 to come. During this time we asked what is the normal custom for Christmas. At this point we were told that everyone stays awake until midnight. Midnight? All I could think was how am I going to stay up until midnight without a nap and why midnight? Before any of these questions could be answered it was time to begin our Liturgy of the Word service. It began with the reading of the Nativity Story over the town loud speaker with the youth acting out the story in the town plaza. As Mary and Joseph travelled to Bethlehem the found the perfect place to have Jesus in our town chapel. Our nativity concluded in the chapel and led into our Liturgy of the Word service. The youth did an amazing job leading the whole service and sharing on the importance and necessity of having Jesus in their lives. We left the service exhausted and hungry from a long few days. We were welcomed once again into one family's home to eat with them. Our Christmas meal was delicious and we were blessed to celebrate with friends. We brought the children home and they gladly got ready for bed. They were tired from the exciting day and they also didn't want Santa to find them out of their beds. During this time exhaustion started to set in but by the grace of God I was able to join in the waiting game. Christ our Savior is Born!!!! Love hearing about your Christmas and all the traditions. Beautiful. Wow!!! What an awesome Christmas tradition you were able to participate in! Thanks for all of the wonderful pictures. We are super excited to join you in Peru!